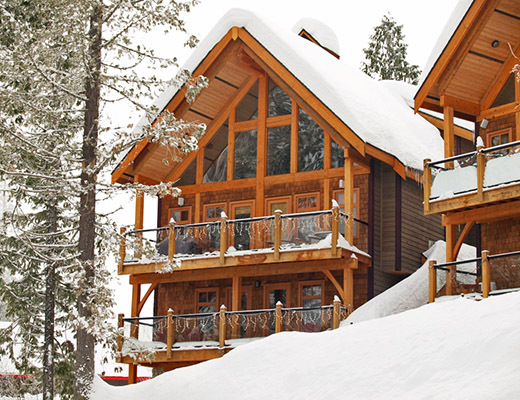 Grey Wolf Cabins are a grouping of five beautiful luxury homes that offer a true â€œski in â€“ ski outâ€ experience at Red Resort. 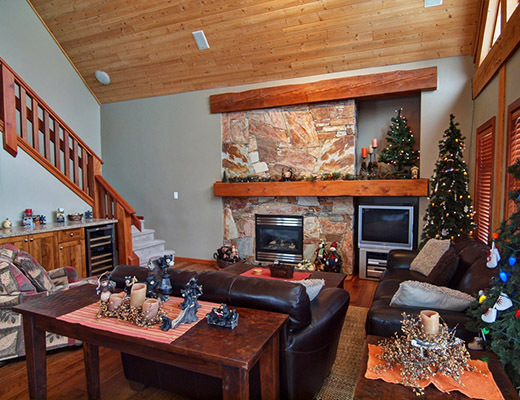 Featuring the best location at Red, these homes are situated slope side at Red Mountain Resort. 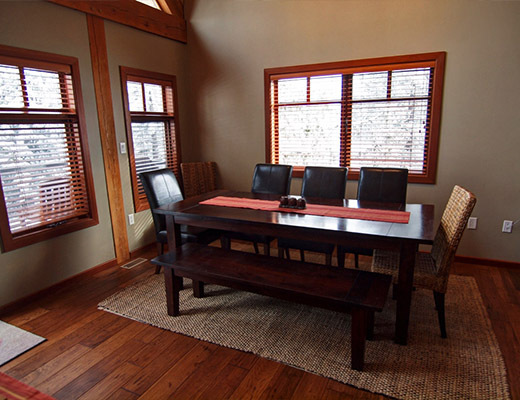 Centrally located too; enjoy just moments walk to Gypsy at Red Restaurant and Rafterâ€™s Lounge at Red and everything the Red Resort base area has to offer. This four storey home has four bedrooms which will sleep a maximum of ten persons. 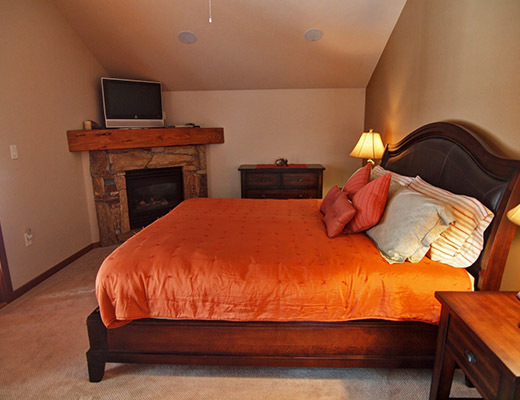 The master bedroom has a queen size bed with an ensuite bathroom and gas fireplace. 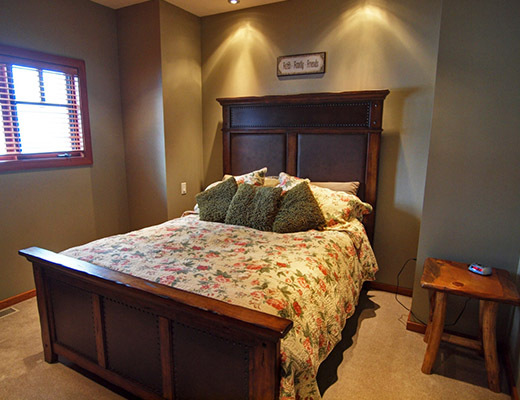 The second bedroom has a queen size bed, bedroom three has two twin-over-double bunk beds, bedroom four has a single twin-over-double sleeping arrangement. There is also a hide-a-bed couch in the downstairs TV room. There are a total of three bathrooms. 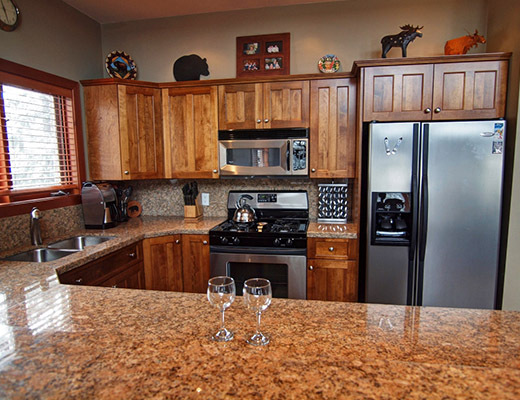 The kitchen area features granite counter tops, stainless steel appliances, a gas stove, ample cupboard space with a breakfast bar and is also adjacent to the formal dining area. The living area features a luxurious leather couch and love seat along with a comfy easy chair with ottoman and a gas fireplace to keep cozy around. Other amenities include a hot tub, BBQ, three decks to enjoy the views from, a TV room, a boot room, laundry, a double garage and plenty of storage.